In stock 68 items in stock. 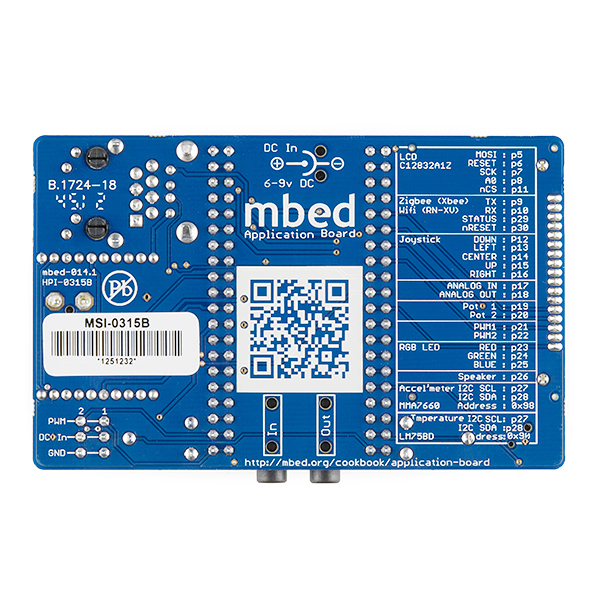 The mbed boards are a series of ARM microcontroller development boards designed for rapid prototyping and this is breakout makes it easy to get up and running with your mbed LPC1768 module. The new application board has been designed to enable the maximum number of potential experiments and projects, with the minimum footprint. And this thing is small. This credit-card sized breakout board makes it easy to plug in to a whole bunch of peripherals. Simply pop an LPC1768 mbed module into the socket and you've got access to a 128x32 graphic lcd, 5-way joystick, MEMS accelerometer, temperature sensor and more! There are headers on either side of the mbed module socket as well so you can jumper off to breadboards and other off-board components. The silkscreen on the back of the board helpfully lists every device on-board and which pins they're connected to, which makes it easy to get your project working if you don't happen to have the reference manual in front of you. 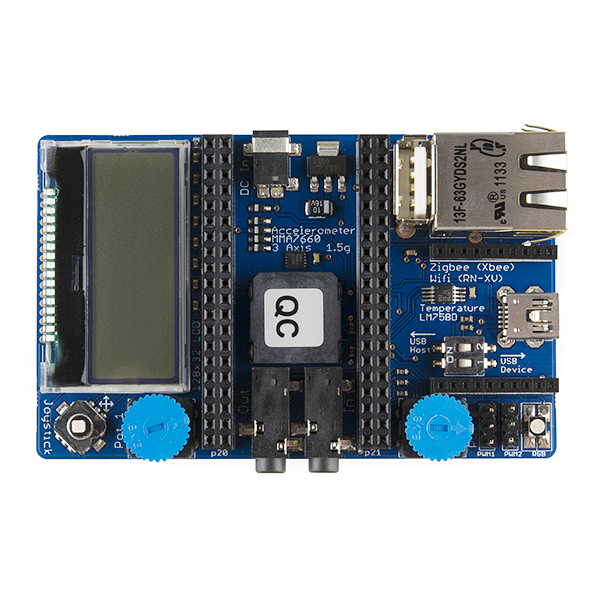 If you're interested in exploring the capabilities of the mbed LPC1768 module, this is an easy way to hook into a lot of different applications. Note: This is a breakout board only, you'll need an LPC1768 module to drive it. If you don't have one, check the related items below! Can someone recommend a DC power plug for this. I believe it is spec'd at 1.3mm center positive. Thanks. You can use any toolchain you wish. All you need to do is create an executable .bin file that can be dropped onto the board. The board connects to your PC as both a serial device and a mass storage controller so drag-and-drop works well. It is even possible to grab the mbed libraries and use them with another toolchain. I did one small project for the mbed using Rowley Crossworks for the toolchain. Yes, this doesn't replace the mbed. It just adds some accessories to experiment with. Any chance for a slim and trim version of this board for LPC11U24? 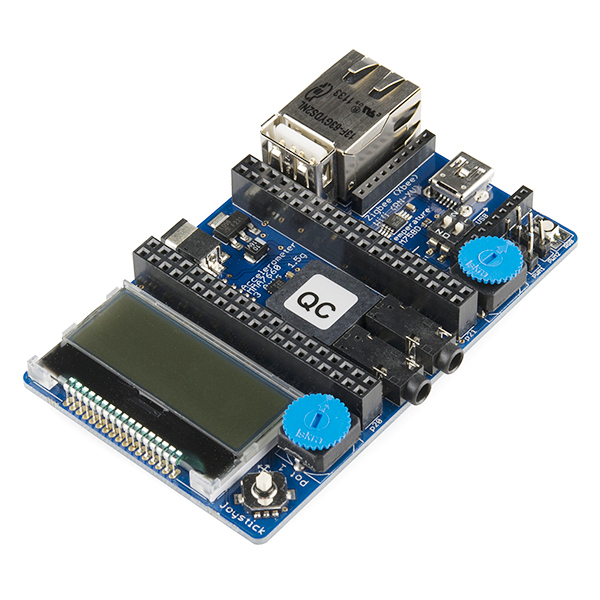 So is this similar to the Arduino Esplora in a way? nah. the esplora is like one of our joystick shields, with a few sensors, with an arduino slapped on. this is just more like a traditional 'dev board', like what olimex makes. I guess they are similar, but the esplora has more buttons and such.